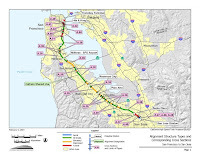 The California High Speed Rail Authority released their 2008 Business Plan, giving a basic overview of the expected capital costs of upgrading the peninsula right of way to accommodate HSR and Caltrain. Construction costs are broken down on page 23. The 50-mile segment from San Francisco to San Jose is expected to cost $4.2 billion to reconstruct (plus 8% program management overhead), or $84.2 million per mile. This amounts to nearly 13% of the cost of the entire SF - Anaheim HSR project. All figures in 2008 dollars. It is not clear how much funding the CHSRA assumes will come from Caltrain's long-planned electrification project, or how HSR will be integrated with Caltrain electrification. 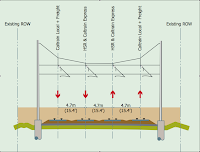 Caltrain's latest cost estimates amount to nearly $1.5 billion to electrify the existing tracks, without regard to HSR compatibility. This includes $785 million for electrification infrastructure, $231 million for signal and crossing improvements, $422 million for new trains, and $100 million overhead for managing the project. That all comes to $20 million per mile in construction costs. It is also unclear how much funding the CHSRA assumes will come from San Francisco's new Transbay Transit Center. This $4.2 billion project (year of expenditure) was planned independently of HSR, although it dovetails nicely with HSR. 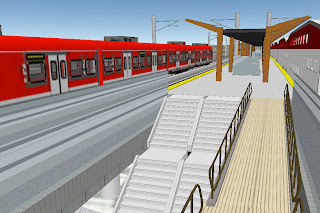 It includes a 1.3 mile extension of the tracks beyond Caltrain's current 4th & King terminal to the new Transbay Terminal in the heart of the financial district. Construction is slated to begin in 2012, with the downtown extension opening in 2018. That's a lot of money, so I have to wonder, do all these agencies expect each other to pay for various costs?